This timeline shows that Cannabis is thought to have first arisen about 34 million years ago based on work by McPartland and Nicholson (2003). Thus, evolutionary change through time has pushed plants, like other organisms, to become very efficient in their environmental interactions. Plants stand out from other organisms not only because they do photosynthesis, but also because they have a cell wall with depositions of cellulose, an incredibly large carbohydrate that functions like rebar in concrete slabs. This is one reason that plants were able to make the transition from water to land; they had better cellular structures (i.e., a rigid cell wall) to hold themselves upright. The development of lignin, the compound that gives wood its characteristic strength, came later in evolution and gave plants an added benefit for living on land. However the fundamental distinguishing characteristic, which sets plants apart from all other organisms, is their alternating life cycles between a diploid sporophyte and a haploid gametophyte. Diploid means that an organism has two copies of each chromosome and haploid means it has only one copy of each chromosome. These alternate between the organism and its reproductive cells. Hence, plants have an alternation of generations. The large pine that might be observed in a city park or a neighbor's front yard is the diploid spore-bearing generation. The pollen you see in the spring is the haploid gametophyte. With this considered, the Cannabis plant is a sporophyte that releases gametes, which includes the pollen. When pollen is released its main objective is to fertilize the ovule, which upon fusing together, yields a diploid embryo. Wondering how plants to new areas then, it follows that the marijuana embryo develops into a mature storage capsule (a seed) that can be transported by birds, or in some cases, the postal service. This is, of course, with the gracious assistance of seed companies. The plant kingdom is nicely divided into many subdivisions, but perhaps the most important one to many plant taxonomists is the family level. Plant families include the sunflower family (Asteraceae), the bean family (Leguminosae), and the grass family (Poaceae). There are more than 300 plant families but the one we will concern ourselves with, at least in this book, is the hops and cannabis family (Cannabaceae). Comparison of how marijuana and humans are placed according to current biological classification. The Cannabaceae family is composed of two genera. Humulus, the plant used for making beer taste "hoppy", has two species within its genus. The genus Cannabis has only one species C. sativa. However, this has been greatly debated. Some researchers argue that a second species originating in India (C. indica) is a valid species. Others content that C. indica is a subspecies and should be treated as a variety rather than an independent species. Years ago, the wild type variety of hemp was referred to as C. ruderalis. The origins of Cannabis have been examined using genetic tools (Mukherjee et al., 2008). Because much of the debate continues on how many species of Cannabis exist, we will leave it to rest for the time being. One reason Humulus and Cannabis are placed in the same family is that hops and marijuana both grow in similar sexual morphs. They are dioecious plants, which means they have separate male and female flowers. Dioecy occurs in ~5% of flowering plants (Thomson, 2006). 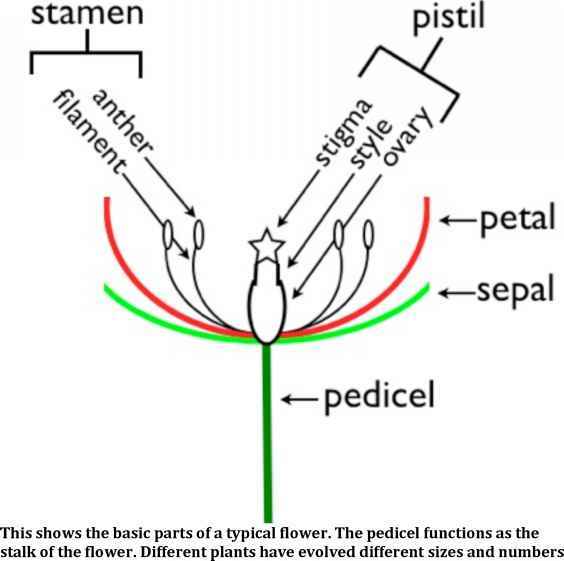 Nearly three-fourths of flowering plants have perfect flowers, due to having both male (stamens) and female (pistil) parts within the same flower. Strangely, Cannabis and a few other plants are outside of this normalcy; their male and female flowers grow on completely separate individuals (i.e., they have imperfect flowers). Because there is a male plant and a female plant, out-breeding (exchanging genetic material between non-related individuals) is maximized, and may be seen as an evolutionary advantage because it allows for more genetic diversity. Hemp is not considered to have large amounts of resin, the material that contains the psychoactive compounds most breeders desire. Resin, a sticky and chemically complex substance, is often secreted through glandular trichomes on Cannabis leaves and flower surfaces. There are two basic types of trichomes, glandular and non-glandular. Non-glandular trichomes, in most species, are small, hair-like projections of a modified epidermal cell that have evolved to restrict water loss from the leaf's stomatal pores, which function similarly to the pores in human skin (i.e., they regulate internal temperature). Although stomata often serve to transpire water vapor from the organism and thus, facilitate a cooling effect, the plant eventually loses this water to the atmosphere. The process of transpiration also helps distribute soil ions, water, and nutrients through the plant. When plants lose water they eventually need additional water at a later time for growth and cellular processes. Therefore to reduce this loss, non-glandular trichomes help retain at least some of the plant's water before it leaves the stomata. Often plants that are adapted to arid or dry habitats are covered with non-glandular trichomes. Most important to Cannabis cultivators are glandular trichomes. These too are modified epidermal cells but function in secreting resin. There are many functions of the resin. Some have asserted that it aids in capturing pollen, however there is presently no research that supports this belief. It seems more logical, and in fact has been correctly asserted, that resin plays some role in attracting pollinators for the flower (Armbruster, 1984). For example, if the female Cannabis is kept free from pollination, glandular trichomes will secrete more resin. The subsequent resin production attracts pollinators through this method. The sticky resin secreted by the glandular trichomes continues production as long as pollen is prohibited from landing on the stigma. Subsequently, this is the reason that many Cannabis growers seek to prohibit male plants from interfering with pollinating their female plants. That is, keeping males plants out of Cannabis gardens increases resin production in female plants. When pollen is used it is often in the form of a controlled crossing experiment. Crossing different plant species is difficult because the pollen grain has exterior surface proteins that must match up with a genetically compatible female stigma of the same species, similar to key fitting into a lock (it simply occurs on a molecular level). The stigma, which is the top part of the pistil that the pollen lands on, also has recognition proteins on its surface. Sometimes this method is faulty and different plant species by mistake successfully interbreed, although this is a rare event. 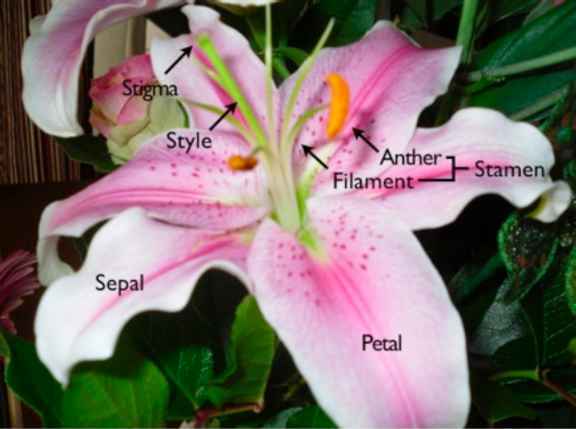 A typical flower (lily) with bracts labeled. The ovary (not shown) is at the base and along with the stigma and style comprises the flower's pistil. Many genes control resin production. However many genes also control the genetic path for plant development. Flowers are no exception to this and many genes have been identified that play a role in the flowering process. The most popular model for flower development is known as the ABC model (Soltis et al, 2007). This is based on the fact that there are four whorls in a typical flower. The first whorl is the sepals. The petals make up the second whorl and as one travels towards the center of the flower the next two whorls are the stamens (male parts) and pistil (female part), respectively. The flowers of Cannabis are interesting in themselves in that they lack petals but have retained their sepals. Collectively, the sepals are termed the calyx and it is the calyx that surrounds the fruit. Within the plant kingdom, various types of fruits exist, the description of which, is beyond the scope of this botanical overview. Suffice it to say Cannabis produces a fruit called an achene, where the seed and pericarp (outer fruit wall) are attached at the funiculus (small stalk). of each part. For example, a Cannabis flower lacks petals and usually has male (stamens) and female (pistil) parts on separate plants. In many cases, transcription factors are needed to give the signal for turning a DNA sequence into a functioning protein. The ABC model describes transcription factors, which are proteins that act like an on/off switch for the genes that allow development of flower parts. The exact function of the A, B, and C transcription factors has been determined through creating mutated plants that have lost various functions of each of these genes. By carefully tracking the mutational defects and the associated observable trait, the function of each gene has been deciphered. Transcription factors for floral development are normally initiated by alternating periods of light and dark, called the photoperiod.